Pat Buchanan, or John C. Calhoun? You be the judge. Answer on the flip! I know further. . . that we have never dreamt of incorporating into our Union any but the Caucasian race–the free white race. To incorporate Mexico, would be the very first instance of the kind of incorporating of an Indian race; for more than half of the Mexicans are Indians, and the other is composed chiefly of mixed tribes. I protest against such a union as that! Ours, sir, is the Government of a white race. . . .
[I]t is a remarkable fact, that in the whole history of man, as far as my knowledge extends, there is no instance whatever of any civilized colored races being found equal to the establishment of free popular government, although by far the largest portion of the human family is composed of these races. . . . Are we to overlook this fact? Are we to associate with ourselves as equals, companions, and fellow-citizens, the Indians and mixed race of Mexico? I should consider such a thing as fatal to our institutions. . . . But . . . suppose all these difficulties removed; suppose these people attached to our Union, and desirous of incorporating with us, ought we to bring them in? Are they fit to be connected with us? Are you, any of you, willing that your States should be governed by these twenty-odd Mexican states, with a population of about only one million of your blood, and two or three millions of mixed blood better informed, all the rest pure Indians, [or] a mixed blood equally ignorant and unfit for liberty. . . ? Answer: It’s an excerpt from John C. Calhoun’s speech on the war with Mexico, January 4, 1848, although you never can tell, can you? (Source: The U.S. War with Mexico: A Brief History with Documents, ed. Ernesto Chavez (Boston and New York: Bedford-St. Martin’s, 2008, pp. 118-120). What about all the Others that think the same way but are not heard in public saying that? Also, Buchanan is a respected, liked and a card carrier member of the Washington establishment. This includes, media, politician and social types. Maybe I missed something. Is criticizing either Calhoun or Buchanan supposed to be controversial? Yes, that’s right: I’m looking to be congratulated for condemning the ideas of Buchanan and Calhoun. What a daring and controversial stand I’m taking! I can haz cookies now? He would if he could, though. (“Sentiments, yes; sentences, no”). Nowadays, Calhoun would be wiping Cheetos dust off the keyboard whilst posting frequent, freeper updates from the outmoded computer (Windows Vista, beeyatches, and you need to re-boot after you hit the “Q” key) in his parents’ basement: the decline of “free,” “white” [also: ‘male’ and ‘gun-slinging’] America is a sad tale to be told. Well, unless you thought that there were some people reading your blog who found Calhoun’s or Buchanan’s ideas palatable,why did you bother to write the post in the first place? Going by Mexican soap operas, however, it appears that all Mexican women are white with blond hair. Mary Catherine: I think you’re probably right about most of the Calhouns of 2012, but I was struck by the consistency in the ideas and the rhetoric from Calhoun to Buchanan over the past 154+ years. Maybe most of the Calhouns of 2012 are marginalized to writing nasty comments on blogs and news stories, but at least one of them is a respected Washington power player. Calhoun’s aversion to “incorporation” didn’t dissuade most of his generation from visions of territorial *conquest* any more than did the different ideas of New England abolitionists. 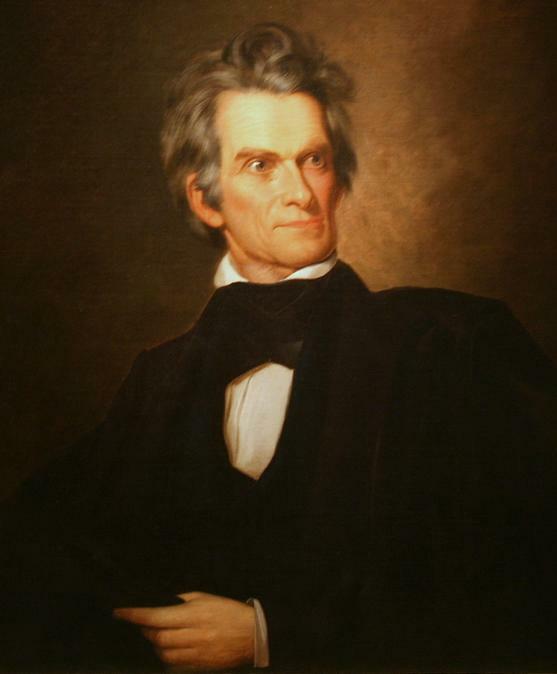 Anyone have any ideas about what may have put that expression on Calhoun’s face below the signature Crazy Eyes–the backward lean and dumbfounded mouth? A boa constrictor slithering into a committee room with a cloture motion grasped in its maw? A senate janitor with a ladder and hammer getting ready to hang a portrait of John Quincy Adams? A long beloved nephew with a backpack, a boat ticket to California, and a request for a $500 letter of credit? Wait — Calhoun and Buchanan are two different people? Are you sure? That doesn’t sound right to me. Indyanna, believe it or not, that was one of the LEAST crazy-eyed images of Calhoun I could find. Just go to images.google.com, and dial up “John C. Calhoun.” The daguerrotypes are particularly disturbing. Wait, GayProf: what? A new book on the 19th C U.S.-Mexican borderlands? Surely you don’t think anyone who reads this blog could possibly be interested in that. Heh, we’ve been juxtaposing that picture of Calhoun with Count Dooku from the Star Wars prequels for our secret project. . . .
H’ann, I agree, the consistency is quite striking. If your ‘Calhoun or Buchanan?’ exercise doesn’t quite work, is “too softball,” as Susan puts it, it’s only because of the 19th-century grammar and syntax, and characteristic Victorian flourishes, of Calhoun’s prose, not because of any fundamental dissimilarity of purpose or intent on the part of Buchanan. The ideas and the rhetorical manoeuvres of the two men are pretty much the same. I think it matters, though (I want to believe, need to believe…), that Buchanan is considered a bit of curiosity nowadays: a lovable (ugh. really? not feeling the love here, but anyway…) curmudgeonly grandfather of US politics who must be given a seat at the table of contemporary political commentary, by virtue of his sheer longevity (but also because, yes, and sadly, US racism and xenophobia have a “pedigree”). That Buchanan even has a soapbox is obviously deplorable, but I can’t help thinking (hoping) he is no longer thoroughly respectable, is no longer quite the thing (unlike Calhoun in his day, is what I mean). 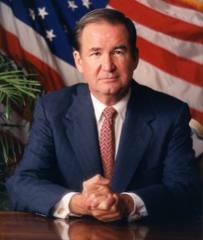 Wasn’t Buchanan recently fired from his position as commentator for MSNBC, e.g.? More grist for the mill of “anti-white” “racism” in some circles, no doubt, but Buchanan is probably only a few audience measurement points away from debasing himself on Reality TV. I would say either Calhoun or John Brown would win a crazy-eyes face-off, but Buchanan can do more contemporary damage. I’ve been saying for years that the modern Republican Party is just a revival of Calhounism.